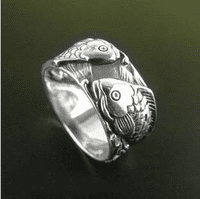 Handmade 925 Sterling Silver Fish Lucky Ring Small Finger Ring. This fish ring was handmade from sterling silver in Thailand. It is perfect for the smallest finger.